You may have noticed that I like to try all these online programs with my kids that I find that help them learn. Here is another one. I hope you enjoy me sharing these with you as much as I enjoy trying them out. I have a great offer to share with you this morning. The world's number one Spanish program for young children. Speekee TV Spanish for Kids is designed so that children can learn Spanish in their own time and at their own pace. 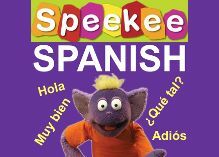 Easy Spanish learning through video, without effort with the multi award-winning Speekee videos PLUS real-time 'virtual' friendships with the Speekee characters. This is Available only on the web. Speekee TV Spanish for Kids is loved by children and their parents. If you are a home schooler this curriculum is said to be fast paced if you want it to be. I am hoping this will help my daughter with her Spanish class as well. I am able to share with you, ONE MONTH FREE of Speekee TV - Spanish For Kids Program - through this exclusive link. http://www.speekee.co.uk/?usfg. I will have a review of the product and how it worked after my children try it out. My children have done great learning some Spanish and even sign language from PBS, however I have wanted to try a more in depth program such as this for them to get a better understanding of Spanish. Disclosure: This post Sponsored by Speekee Spanish! All opinions are my own and will be my own will I review this after we try it out with the kids. Hola Missy, I just want to say thank you very much for your post, it is very much appreciated. Gracias!